If you are an auto enthusiast or a mechanical engineer, you probably know what gearboxes or transmission systems are and how immensely complex they are ! Today in this article lets know about them in depth. What is gearbox? what are the main components of gearbox? Why do we need them? EVERYTHING. A gearbox or a transmission system in an automobile is a machine which uses multiple gears, shafts and actuating parts to transmit power from engine to the wheels. Clutch shaft OR driving shaft is a shaft which takes power from engine to further supply to other shafts. As the name suggests, the driving shaft is connected via clutch & when the clutch is engaged, the driving shaft also rotates. The clutch shaft has only one gear fixed on it and it rotates with same speed as engine crankshaft. Also, the driving shaft and main shaft are in the same line. 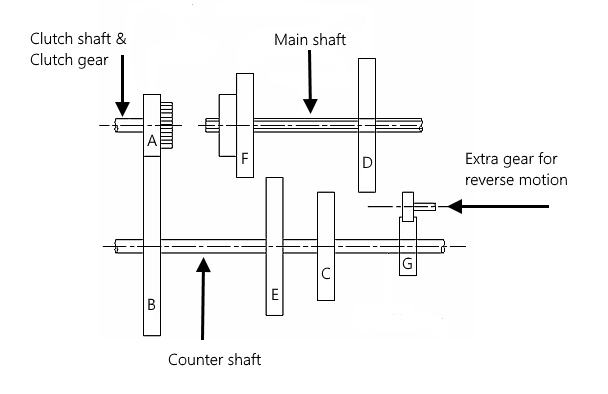 Counter shaft is longest among the 3 in the gearbox. It has multiple gears of various sizes which is able to produce a wide range of torque. The counter shaft rotates at a different but constant speed just like the clutch shaft. The main shaft OR output shaft is which rotates at different speed and also provides the required torque to the vehicle. The output shaft is a splined shaft so that gears or synchronizers could be moved in order to engage or disengage. The neutral gear is the position in which no gear on output shaft is engaged with counter shaft. The output end is connected to the differential of the vehicle via double Hooke’s joint. Minimize frictional losses, so that maximum power can be delivered. Gears are used to transmit power from one shaft to another. The amount of torque transmitted via gears depend on the number of teeth and size of the gear. Higher the gear ratio, higher the torque/acceleration and lesser the speed. All the gears are fixed on their respective shafts except the ones on main shaft; they can slide into either of directions along the shaft. If the ratio is greater than 1, the vehicle will possess a high acceleration & if the ratio is greater than 1, it will travel at high speed. The following gear ratios will help you understand it. This explains why our vehicle is able to achieve greater speed as we go on shifting gears up. Gear selectors are just simple devices which uses a lever to select a gear for engaging in disengaging mechanism. The motion of the lever slides the engaging part on the shaft. It depends on the type of gearbox whether the lever slides the gears or the synchronizers which are already meshed with the main shaft. Now, there are various types of transmission systems which consists of dozens of complex modern parts and they’re different in every case. So above, we have discussed about the main parts of a gearbox which are common irrespective of their type. Why do we need gearbox ? To carry high loads OR climb steep slopes as well as achieve high speeds on straight roads. To keep the engine running even when the vehicle is not moving. To be able to drive the car backwards by shifting to reverse gear. How do gearboxes work ? The working of modern automatic type transmissions and synchro-mesh gearboxes are very different than the earlier ones. The working here explained is of the most simple one – Sliding mesh gearbox. Now here, imagine that the clutch shaft is continuously rotating along with the counter shaft. NEUTRAL– As no gear of the counter shaft is meshed with the output one, the vehicle is at rest and transmitting no power to the wheels. 1st GEAR– When the gear D moves on the left side on the sleeved main shaft, power flows through A-B-C-D-SHAFT-WHEELS. Your vehicle is now in 1st gear with an approx gear ratio of 3:1. 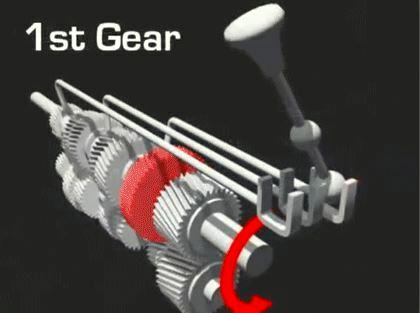 2nd GEAR– When gear F is moved on the right side, power flows through A-B-E-F-SHAFT-WHEELS. The vehicle is now in 2nd gear with gear ratio of 2:1. 3rd GEAR– To shift into 3rd gear, we must slide the gear F to the left side. This way, the lay shaft directly gets meshed with the clutch shaft and they both rotate at same speed which makes a gear ratio of 1:1. The power flow will be A-F-SHAFT-WHEELS. Also at this moment, there is no contact between counter and lay shaft. REVERSE GEAR– For engaging reverse gear, the gear D is moved to the right side. The gear D here meshes with a small gear which is always meshed with gear G. The small gear works as an idler gear and main purpose of it is to reverse the direction of rotation.